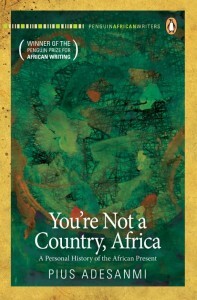 "YOU'RE Not a Country, Africa: A Personal History of the African Present"
"The picture that he paints is in many ways very grim. Yet his writing is buoyant and he is not without hope; hope that Nigeria, and Africa as a whole, will pull itself together and use its best instincts to devise a valid ideal and workable political and economic policies. This book helps one to entertain such a hope." Nigerian writer, philosopher and scholar. Associate professor of Anglophone and Postcolonial and African Literature at Northeastern Illinois University, Chicago. Wanted dead or alive: Happy African Writers!